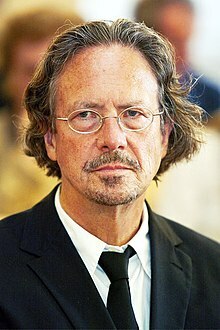 Peter Handke (born December 6, 1942 in Griffen (Carinthia)) is an Austrian author and translator of books. Peter Handke is known for his extremely critical (and perhaps even absurd) plays. Perhaps his best-known play is called Publikumsbeschimpfung (translates roughly as insulting /offending the audience). The play consists of actors insulting and offending the audience, and later congratulating them for the good performance. The play has been labelled as antitheater. Wikimedia Commons has media related to Peter Handke. This page was last changed on 6 December 2017, at 22:13.